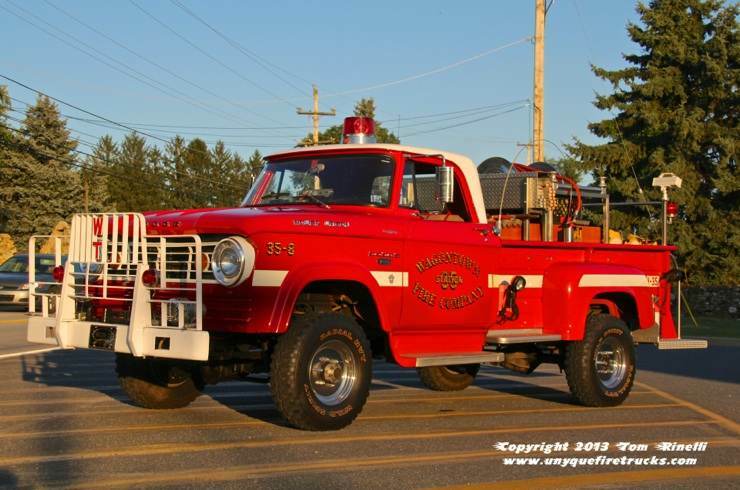 Brush 35-1 - 1967 Dodge W300 Power Wagon 250 gpm/250 gal. Still operating in first line service, this rig has been maintained in the pristine original condition shown simply through regular maintenance. Equipped with four wheel drive, it features a 1,000 watt inverter and a 200’ booster reel. Its’ equipment complement includes Class A foam, 100’ of 3” supply line, 1,200’ of attack line in various sizes (300’ of 1-1/2”, 500’ of 1” and 400’ 3/4” forestry hose), 20’ of suction hose, a chain saw with chaps, forestry tools and wildland water supply appliances. 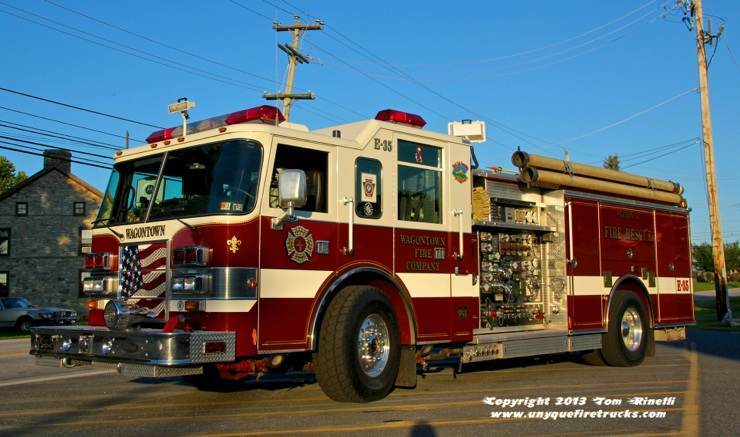 Brush 35-2 (“The Deuce”) - 1982 American General 300 gpm/1200 gal. Carrying two 1,000 watt portable generators, it is equipped with Class A foam, 20’ of suction hose, a chain saw with chaps, forestry tools and wildland water supply appliances. Its’ extensive hose load includes 300’ of 3” supply line as well as 2,700’ of assorted size attack line (1,000’ of 1-1/2”, 800’ of 1” and 900’ 3/4” forestry and 200’ booster). 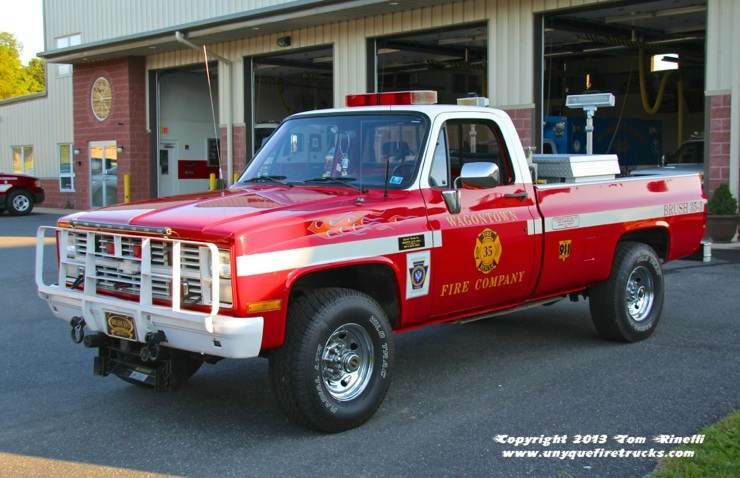 Brush 35-3 - 1986 GMC 1 Ton 125 gpm/125 gal. Equipped with a 5,000 watt portable generator, it carries Class A foam, a total of 1,550’ of assorted size attack line (150’ 1-1/2”, 800’ of 1”, 500’ of 3/4” forestry and 100’ booster), 20’ of suction hose, wildland hand tools, water supply appliances and medical equipment including a BLS bag and AED. 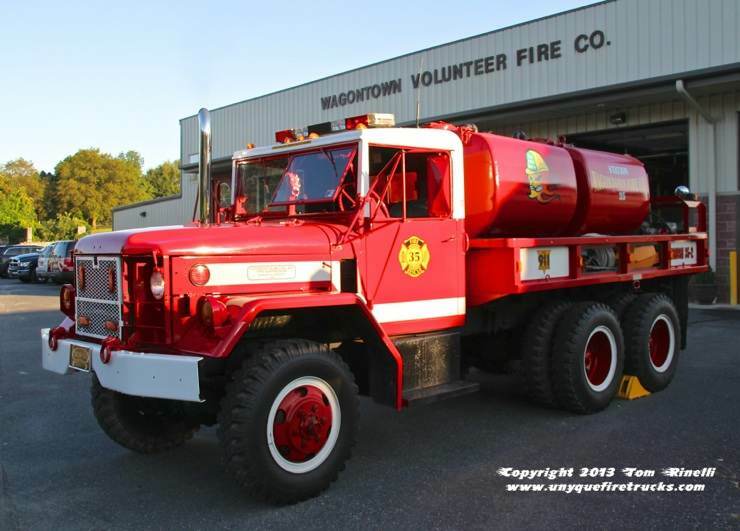 Organized in 1947, Wagontown Fire Co. provides Fire & Rescue protection to both West Caln and West Brandywine Townships. Forty volunteers answer an average of 320 alarms annually while the Westwood Fire Co. which houses a BLS ambulance at Station 35 responds to 1,200 alarms. Equipped with a 15KW generator, it carries a three piece Hurst extrication tool system. In addition, it is equipped with 1,300’ of 5” LDH supply line, 600’ of pre-connected “lead line” (200’ of 4”, 400’ of 3”), a 200’ 2-1/2” pre-connected “Blitzfire” monitor, 1,100’ of 1-3/4” pre-connects, 300’ of 1” forestry hose and a 200’ booster reel. A thermal imager, four gas & CO meters as well as electric and gasoline ventilation fans round out its’ equipment inventory. Special thanks to Chief Todd Ziegler for arranging my visit as well as Lt. Andrew Moore, Lt. Greg Ziegler and FF Josh Kromer for their assistance in positioning the apparatus for photos. Formerly serving the military, this rig features a 10,000 lb. front winch and a rear directional arrowstick. Its’ equipment complement includes a 1,000 watt portable generator with portable floodlights, rope rescue gear, Stokes basket, traffic control supplies, water/dry powder extinguishers, wildland hand tools, a CO meter, spare 15HP boat motor and a BLS level EMS bag. 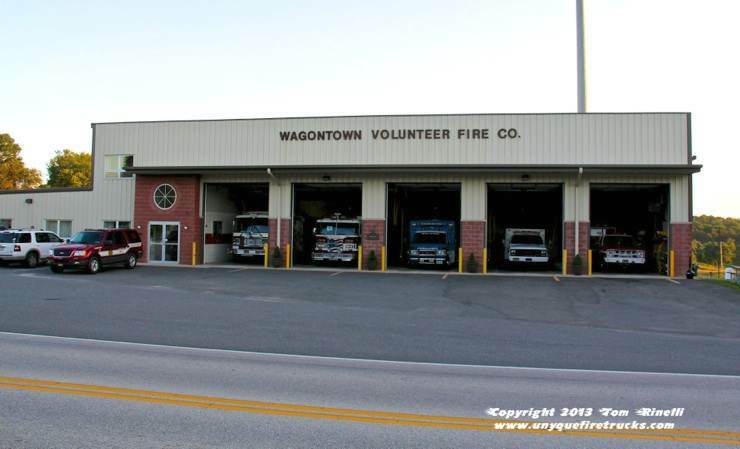 Dedicated in 2007, this five bay (three double deep) firehouse houses Wagontown’s entire fleet including an ambulance staffed by members of the Westwood Fire Co. providing BLS level care. In addition to a banquet hall, a “unyque” on-site amenity is the Wagontown Swim Club, a fully functioning membership sponsored swimming facility complete with a kiddie pool and full service snack bar. 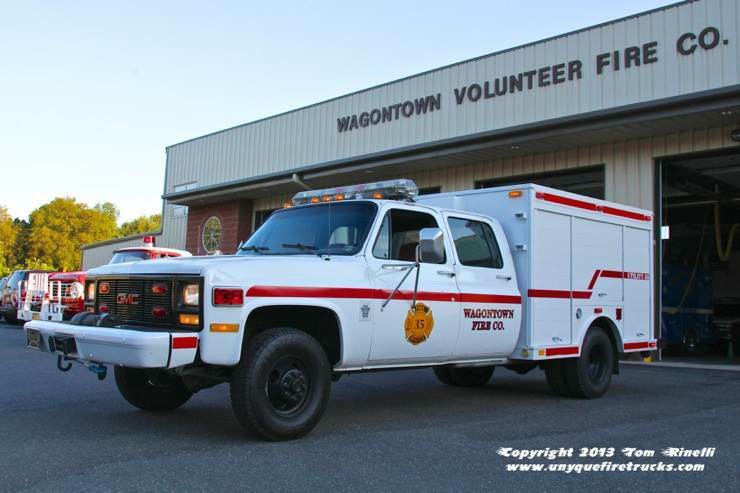 Wagontown also operates Rescue 35, a 2003 American LaFrance 2000/750 rescue engine featuring a 15kw generator, pre-connected Hurst extrication tools, high pressure air bags, rope/ water/trench rescue gear and an acetylene torch.